With Caburnio 2010 we reached an excellent synthesis of the characteristics that the wine has shown in the last three years and which represent the aim that we pursue with this label: freshness (2009), balance (2008), typical Maremman character (2007). With its bright and decisive red colour, a succession of scents of roses and berries emerges in the nose followed by grilled pepper and mint. 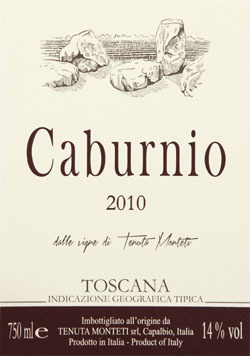 Full in the mouth it leads to a lingering finish sustained by good acidity, nicely completed by mature tannins. Winter was mild and the vines budded regularly at the end of March. Spring brought some rain which slightly slowed vegetation. The summer was hot and dry, pushing the harvest to the beginning of September. The result of this season was a smaller yield of high quality grapes with an excellent balance of sugars, acidity and polyphenols. The first grape variety to be harvested was the Merlot, followed by the Alicante Bouschet. The Cabernet Sauvignon was harvested between the last few days of September and the beginning of October.